The secret message puzzle is particularly suitable for children's puzzle magazines, and for variety word puzzle collections. This puzzle is like a word search but with quite literally a hidden twist right at the end of the puzzle! 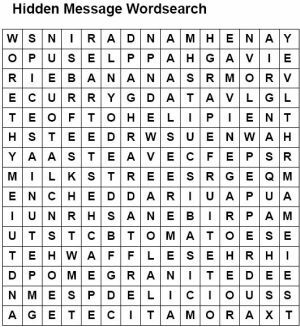 The puzzle starts like a standard word search and you must find all the words given in the grid. However at the end of the puzzle all the words that are not used in the solution can be pieced together to reveal the hidden code, message or phrase. This adds a fun final twist to the traditional word search puzzle. You can view a sample Hidden Message Puzzle online.